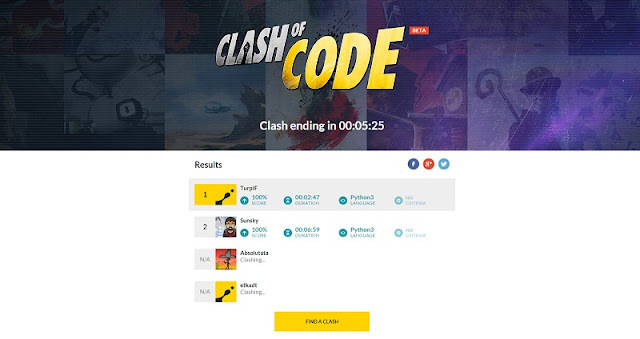 The open Beta of Clash of Code has been on for a few days now and your first feedback are really positive. CoC is a new multiplayer gaming mode where you can challenge your friends in short coding battles. The aim is to solve a given puzzle within the constraints of a given game mode. We've created Clash of Code the way we, as coders, would enjoy it the most: something cool to play with for a coffee break, fun and laid-back. You can choose either to launch your own Clash and wait for players to join or invite people you know (you follow) to join your game, or you can decide to join an existing Clash choosing one from the lobby. You'll enjoy the challenges whatever your programming skill level: the outcome of a Clash will essentially depend on the people you will play against, and how fast they can be. Fastest: the aim is to be the first one to solve the problem. This mode is particularly interesting to train yourself to code as quick as possible. Reverse: you have to code without being able to see the statement. This mode is perfect to find the logic of a specific problem before starting to code the solution, as a kind of enigma. Any suggestions? Don't hesitate to tell us what you think on the dedicated thread on the forum. Hi, we are using a TrueSkill type ranking system (TrueSkill is used by Microsoft to rank a large number of players on mulitplayer games on Xbox).